Aguas frescas are a staple in most Mexican and Mexican-American homes, mine included. The best aguas frescas are made with ingredients that are in season because they’re easiest to get, typically cost less because they are more abundant, and have the best flavor because they’re at their peak growing season. Honeydew melon—also known as melón verde—is in season typically from May to October, with the peak from May to August, but we’ve been seeing a lot of this melon in the grocery stores in Southern California since mid-March. 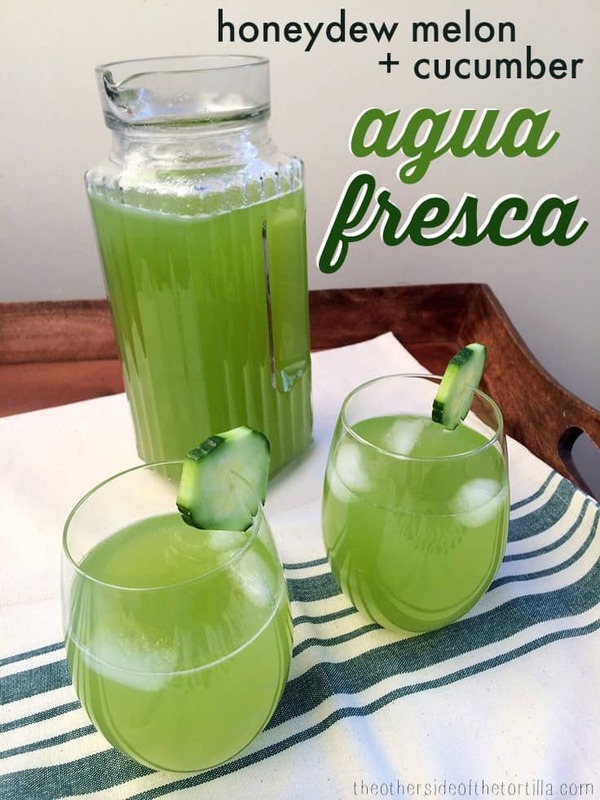 This honeydew and cucumber agua fresca recipe is light and refreshing for warm spring and summer days. You can also opt to serve it straight as a juice with breakfast—just run through a juicer or powerful blender and leave out the water and optional sugar. Choose a melon that ‘s firm, but not hard. It should have a fruity, floral scent when ripe, and the heavier a melon is, the juicier it will be. The rind should be slightly waxy and yellowish-white, with no bruising or punctures. Avoid melons that have very white rinds. Slight brown freckling on the melon is an indication of its sugar content, not necessarily that there’s anything wrong with the melon. The more brown freckling it has, the sweeter it will be. You can also knock gently on the melon; a deeper sound means the melon is ripe. Ripen melons at room temperature. Cut honeydew melon can be kept in the refrigerator for up to three days. A sweeter, riper melon may not need any added sugar to this agua fresca recipe, which is why I recommend waiting until the very end to decide whether you want to add sugar or not. I prefer English cucumbers, sometimes sold as a “seedless” variety, due to their uniform long shape and lack of seeds in comparison to a regular cucumber. They’re also slightly sweeter and have a crisp texture. They should be firm with no soft or yellow spots. Their skin is edible; it’s not waxed like the regular cucumber, and therefore is not bitter, but this recipe calls for peeling the cucumber regardless. They may also be called hothouse cucumbers. They’re typically sold wrapped individually in plastic, and typically last in the refrigerator for about a week. This kind of cucumber is generally available in the U.S. year-round. A refreshing melon and cucumber drink, made-from-scratch for warm spring and summer days. IN A JUICER: Remove the melon rind and cut melon into spears. Cut off the ends of the cucumber and peel it, then cut it into 2-3 pieces. Put melon and cucumber through your juicer. Add 2 cups cold water and mix well. Taste the water to determine whether you need to add more water or add sugar. If you want to add sugar, dissolve 2 or 3 tablespoons sugar (or more to taste) in a little warm water and then add to the pitcher. WITH A BLENDER: Remove the melon rind and cut melon into bite-sized chunks to make it easier for your blender to puree. Cut off the ends of the cucumber and peel it, then cut it into several small chunks. Add melon and cucumber to blender with one cup water; blend on high until the fruit is completely pureed. Add another 1.5 cups of water and blend until incorporated. Pour through a fine mesh sieve into a pitcher. Taste and decide whether you want to add more water or sugar. Serve over ice. Garnish with a cucumber slice. If the agua fresca is not consumed immediately, refrigerate for up to 3 days. 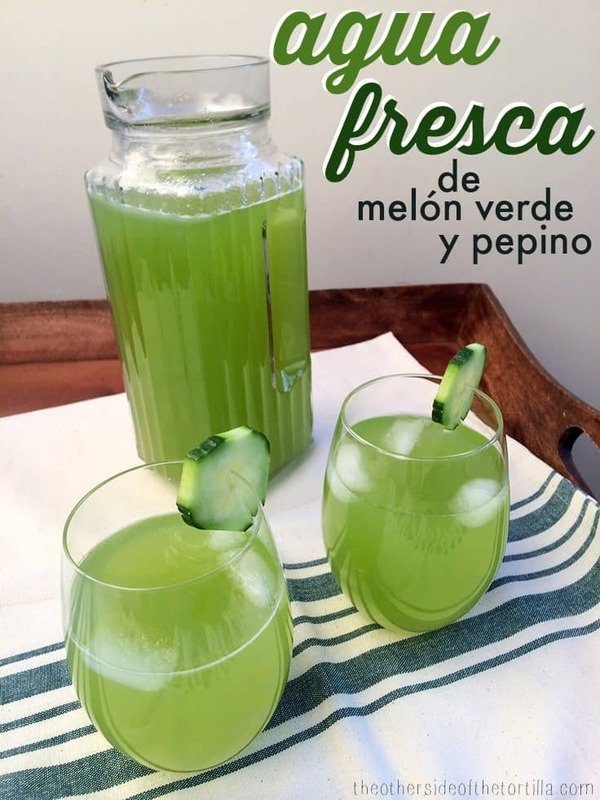 Love agua fresca de melón? Check out our recipe for agua fresca made with cantaloupe.